Chapin Hall, a research and policy center, focused on a mission of improving the well-being of children and youth, families, and their communities, and Voices of Youth Count, a national initiative designed to fill gaps in the nation’s knowledge about the scope and scale of youth homelessness, wanted to determine how many youth experience homelessness. 1 in 10 youth between 18 and 25 experienced some form of homelessness in a year. 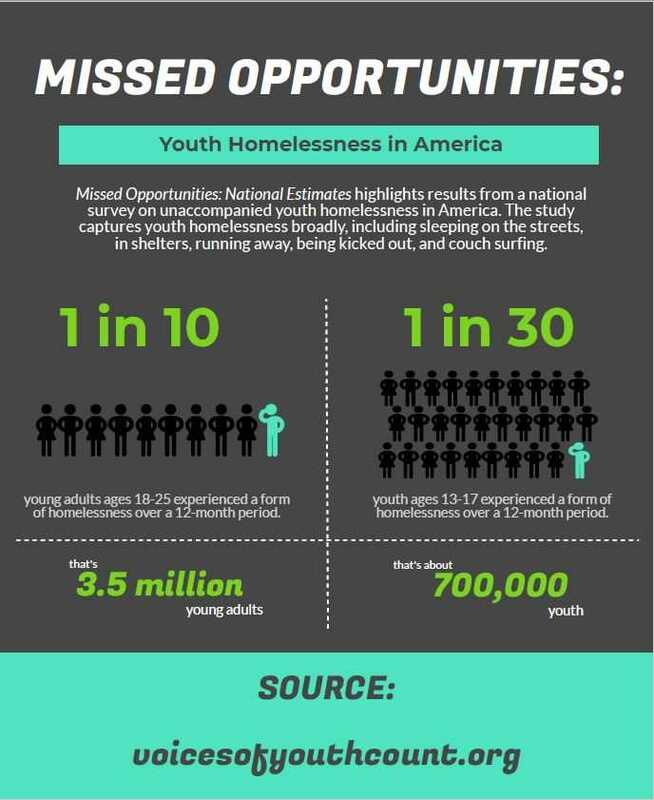 Youth ages 13-17 had a 1 in 30 chance of having a homelessness event in the same 12 month period. These numbers are higher than some earlier estimates. They looked into the ways that young people survive during times when they have unstable housing, often shifting between temporary circumstances like couch surfing and living on the streets. The study found that prevalence of homelessness amongst youth and young adults is roughly the same in urban and rural areas, however rural youth face different challenges when they become homeless. Rural youth, according to the survey, rely more on couch surfing than their counterparts in urban communities. In rural or sparsely populated areas, there are fewer resources, such as shelters, to help youth who find themselves without stable housing. The study also found that some youth are at a greater risk of experiencing homelessness than others. Youth with less than a high school diploma or GED had a 346% higher risk than their peers who completed high school. Unmarried parenting youth were 200% as likely to report homelessness. Black or African American youth and Hispanic youth were overrepresented, while LGBT youth were also more likely to become homeless. The report concludes that prevention and intervention strategies are badly needed for this population. “There are no silver bullets,” they say, “but the efforts and investments to end youth homelessness are worth it.” Youth homelessness is a complex issue, and multiple interventions are needed across the board. It is of paramount importance that young people receive services tailored to their situations, identities, and developmental needs. “The challenge involves a scale that requires greater coordination and resourcing of multiple systems and programs – behavioral and physical health, child welfare, education, employment, housing, justice, and outreach – at local, state, and federal levels to drive these numbers toward zero,” the report concludes. As the national communications system for runaway and homeless youth, the National Runaway Safeline works to connect youth to those resources that are available, but more is needed to help us reach toward our mission of keeping America’s runaway, homeless, and at-risk youth safe and off the streets.